Exclusive Magnetic Clasp & Striker Plate. Machined from Durable Ultra Light Aluminum. Fits all 2005-2009 S-197 Mustangs V6 & V8. The Bullitt Style Billet Fuel door adds the extra level of personalization to every color mustang keeping you at the front of the pack. 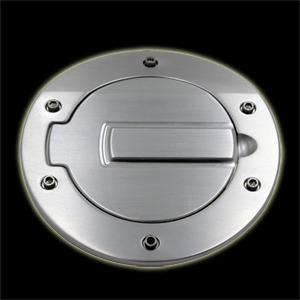 This Mustang Style Fuel Door is crafted from durable Ultra Light aluminum. Stain and Weather resistant. 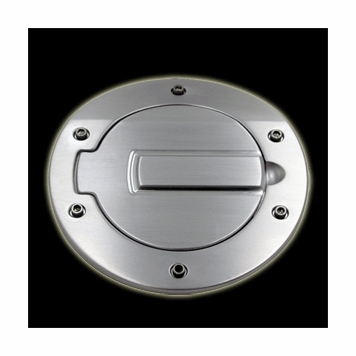 This fuel door uses a magnetic clasp & striker plate to keep the door securely closed. Crafted to fit better than an OEM part, while giving you the bold clean styling of the aftermarket Dress Ups. 05-09 V6 V8 LX GT GTS GT500 Mustang Cobra Shelby Roush Saleen and Steeda Vehicles.